Tamar Ashdot, a senior double-majoring in English and Judaic studies, exhibited the results of her project, “With Love, From Rosario,” on Tuesday evening. Ashdot participated in the Harpur Fellows Program, which funded her community service project in Rosario, Argentina. Tamar Ashdot, a senior double-majoring in English and Judaic studies, debuted her photo exhibition, “With Love, From Rosario,” on Tuesday night at the Harpur Edge office in Library North. 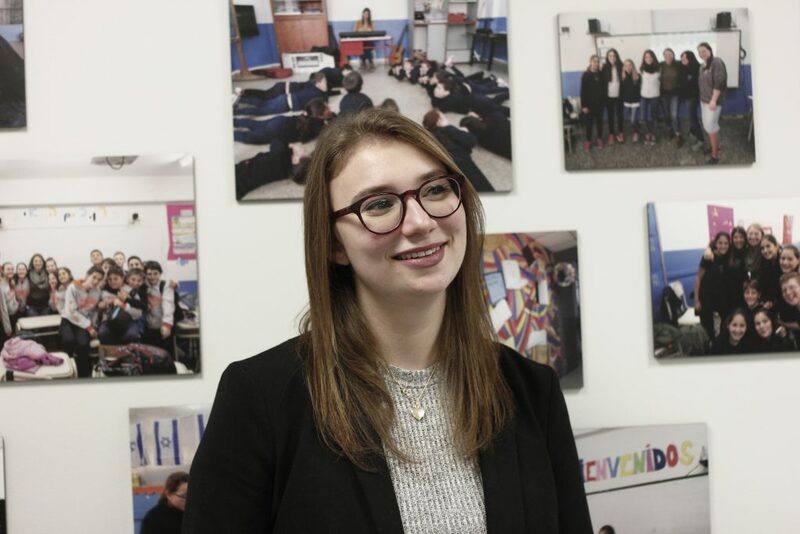 Ashdot traveled to the port city of Rosario, Argentina this summer, and through volunteering as a teaching assistant in music, English and Hebrew, said she was able to learn about a different side of Judaism. “With Love, from Rosario” highlights the people and places that impacted Ashdot’s experience while in Rosario: smiling young Argentine students at Nueva Escuela J.N. Bialik, a Jewish day school, sporting events at the local Jewish recreation center and members of the Victor Lein Choir at the local synagogue, whose intergenerational membership includes singers from the ages of 10 to 75. Ashdot went to Rosario as a Harpur Fellow. The Harpur Fellows Program, facilitated by Harpur Edge, provides up to four students with up to $4,000 to design and conduct their own community service project over the summer anywhere in the world. Other initiatives funded by the program include a project promoting computer literacy in Bangladesh, financing volunteer work at a medical clinic in Nigeria and the organization of a New York City field trip for Chinatown seniors in assisted living. Ashdot said that Wendy Neuberger, the director of Harpur Edge, was instrumental in helping her apply for the fellowship and create and organize her program in Rosario. “It is a great opportunity and not enough students take advantage of it,” Neuberger said. Ashdot, however, said she is glad she did. Ashdot’s initial proposal for the grant was to form a connection among Jewish identities in Rosario through music. Ashdot spent most of her time volunteering in Argentina as a teaching assistant at Nueva Escuela J.N. Bialik, the only Jewish day school in Rosario. In a city with 5,000 Jewish people, the school caters to all kinds of Jewish students of varying faith and practice. As the night wrapped up, Ashdot and several friends performed two traditional Argentine Jewish songs that she learned during her participation in the Victor Lein Choir. Ashdot, who is the vice president of Kaskeset, a BU a cappella group that sings Jewish songs, was accompanied by fellow Kaskeset member Talia Laserson. Laserson, a senior majoring in human development, said that learning the traditional Argentine Jewish songs was a unique experience. “The words of both of those songs are popular Hebrew liturgy, but I know them to different tunes,” Laserson said. Ashdot said she wanted to share an understanding of how Argentine culture interacts with Judaism.